OK, so I STILL have an obsession with scones. Yes, I know. But this one was really really amazing. Really and truly. This isn’t your basic cream scone that is kind of dense and a little dry. Oh no. No no no. This is cake-y and flaky (not flakey like me, but flaky in a good way,) and crumbly deliciousness. This has more of a fluffy coffee cake texture. 5 tbsp unsalted butter, frozen (or chilled) and grated (or cut into 1/4 inch cubes) do not remove from freezer (or refrigerator) until you’re ready to use it and incorporate it into your flour mixture. Preheat your oven to 450 degrees and adjust your baking rack to the middle center. Prepare a baking sheet with a piece of parchment paper. In a large bowl, whisk the flour, sugar, baking powder, salt together. Cut the butter into the flour mixture with a pastry blender until it resembles course corn meal or until the butter is crumbled up into the flour. If you’re using Ginger, add it at this point. Cut the peaches into slices then cut them into chunks. Leave a few pieces to go on top of each scone. 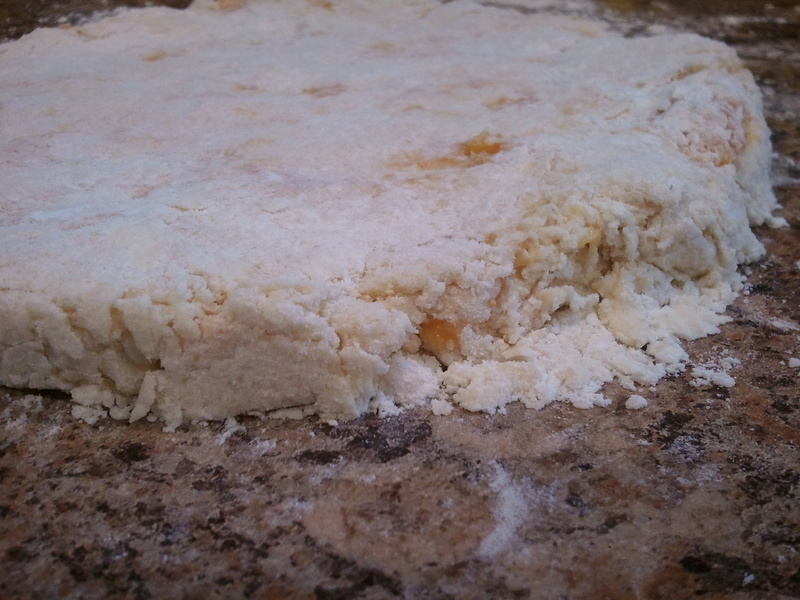 Gently fold the peaches into the flour mixture until coated. Add the cream and fold the mixture until well combined. The dough should be slightly dry – not wet and really sticky. If it’s wet, add more flour. Turn the dough out onto a lightly floured surface and pat gently into a disc about 3/4 inch deep and about 9 inches wide. Here, size doesn’t matter – THAT MUCH. Just make sure it’s in a circle and it’s not too thick or you will need to adjust your baking time. 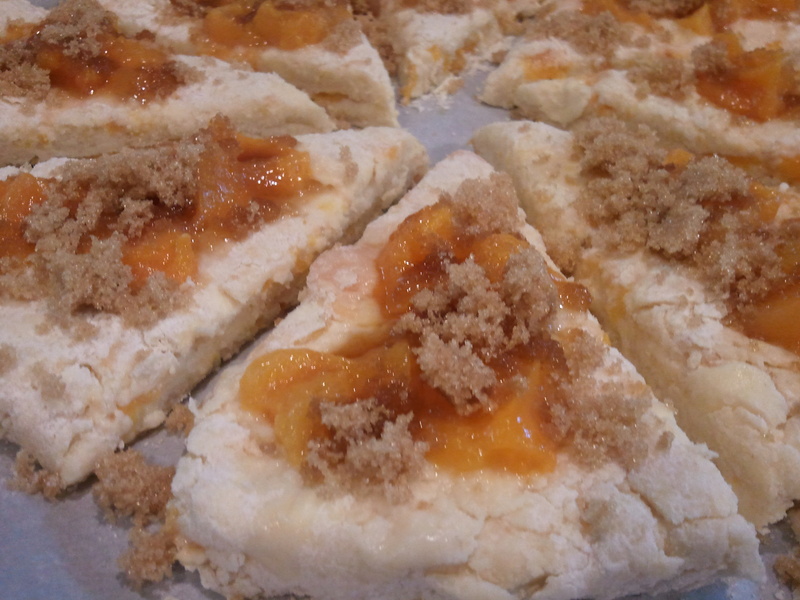 Gently place and kind of squish the extra peaches into the top of the scones. Then sprinkle generously the brown sugar on top. 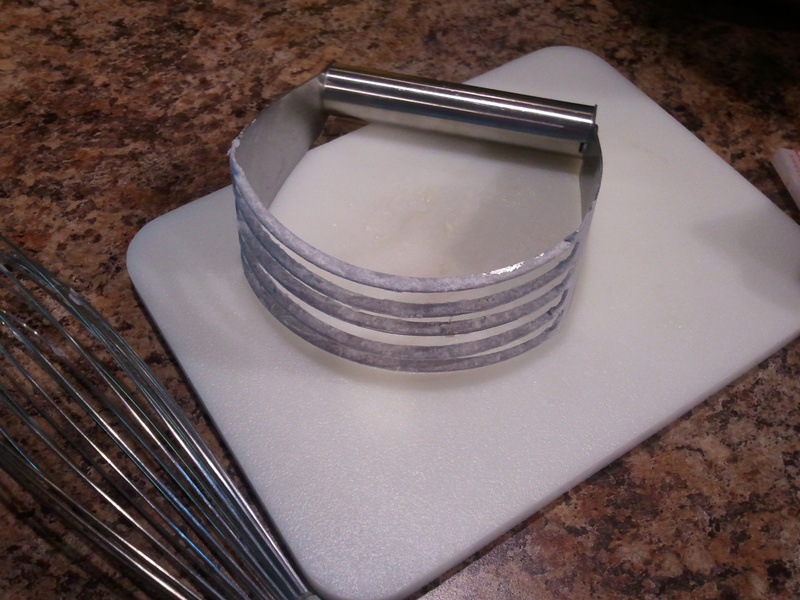 Cut your disc into 8 equal pieces and lay the triangles evenly onto your parchment paper covered cookie sheet. Try to leave at least 3/4 to one inch between (because they’ll puff up). Bake for 13-15 minutes or until the edges are lightly toasted. *try to turn the sheet at about 7 minutes. Let cool for at least 10 minutes before eating. Wipe the drool off the counter before serving. Yum, yum, yum!! I can’t wait to try these! !